I know it's a bit early, but I thought I would do my Summer Picnic post now. I am hoping to get the back of our basement organized. It's the room that catches just about everything, just about anywhere. My fear, I'm going to go in there and get lost. If you don't hear from me in a few days, you might want to call the authorities. This week's picnic is, of course, the celebration of July 4th. I know it may seem silly, but as soon as I hear July 4th it's fireworks! Our public fireworks have been cancelled the last two years because of rain, I'm keeping my fingers crossed for this year! This is a unit I have never done before so I went to that trusty Mailbox and found some great ideas--along with a simple one of my own. I have a few different July 4th ideas so this post may get a bit long. I hope I can keep your attention. Also, I am not at school much so I'm scrounging around for materials, but I think everything worked out well. The hardest part of this project may be finding a 35mm film canister. I'm lucky I have some hanging around here still. 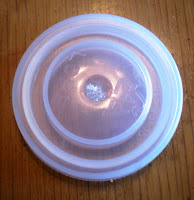 Poke a hole in the lid of the canister with some scissors. 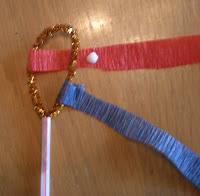 Have your child cut some curling ribbon they like--it can be any color. Your part is to feed the ribbon through the hole and knot them together underneath. 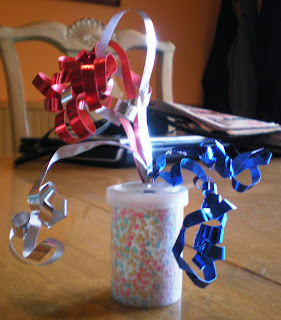 While you take care of the ribbon, have your child paint the INSIDE of the canister with glue. Let them pour in some glitter and shake it up to cover all the inside of the canister. Pop the lid on and let them through it high in the air. Hooray! This one is pretty easy--mine of course, very basic. 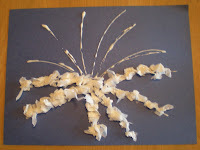 Give your child some glue to draw a firework. 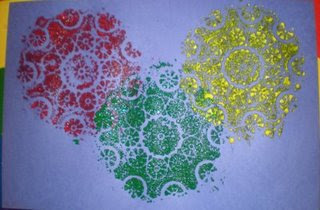 Sprinkle glitter over the glue drawing and shake off the excess. 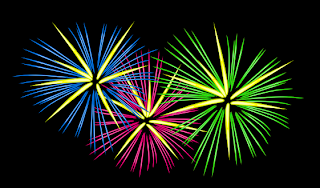 If they like they can add more fireworks in different colors. Remember you have to do one at a time if you are doing different colors. This project turned out pretty cute. I wasn't quite sure at first, but it gave a pretty good bang for the buck. One caution--it can be time consuming for little ones. You might want to make small fireworks. 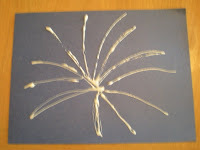 Again, draw a firework with glue. Take some tissue paper and let the little ones rip it into pieces, make a ball out of it, and then stick it on the glue. (I only had white tissue paper at home. I think this would have looked great in color, or smaller fireworks with different colors). I had trouble with a name for this project. My family came up with shaker, firework shaker, streamer, shaker streamer thing, pop pom, so take your pick. 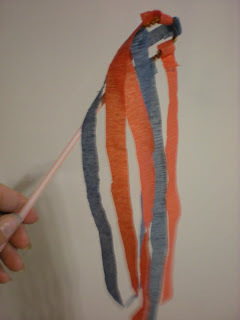 I was lucky to find some red and blue streamers, but I think you can use any color. I took two lengths of about 1 foot then cut each length into 3 strips--so I had 6 pieces. 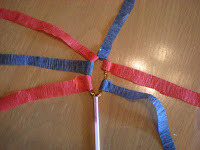 Take the pipe cleaner, fold it in half, and twist together the ends--you want to have a loop in the top. Take the part that you twisted and push it down into the straw. Take one streamer and lay it down. 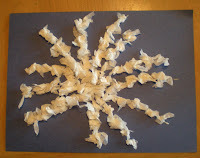 Place the loop on top, put a dot of glue on a piece of the crepe paper and fold it over to glue it to the loop. (I'm hoping the picture is more understandable than that explanation--I'm not sure I even understand that.) Do the same with all the rest of the crepe paper pieces. Now pick it up and shake it around. I thought it might be fun to take to the parade. I hope you all have a wonderful 4th of July. I will probably be back before that, but this seems like a good time to offer good wishes. Oh, I almost forgot, don't forget to check those fabulous fireworks I made a while back. I love every single one of your ideas....now I know what we will be doing this afternoon! Great ideas. They all look so fun. 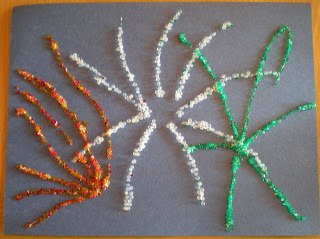 Loved your ideas... hope you don't mind us using the glitter fireworks tomorrow... my school agers can't wait. They also want to try the wand... the girls (all ages) saw that and started talking about how to make them and use them right away!!! Thanks!! Love the Glitter fireworks. My monkey would like that! 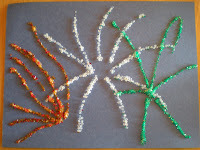 I love the homemade fireworks craft you made! You guys were busy crafting this week:-). It all looks like alot of fun! 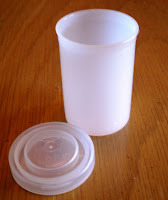 the canister idea is a really good one! Great ideas. I really like the glitter fireworks. They are so easy, but so festive! Awesome ideas! The streamers are super cute! Hopefully, I have some blue streamers somewhere hidden! Wow, such a wealth of great ideas! You're right about having a hard time finding the film canisters though! I used to do a bunch of projects using them in my classroom because we'd always have families donate film at the beginning of the year. Now what'll I do?! 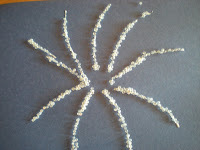 Really like how the glue and glitter fireworks came out. We tried it and our looks like they do after it's burst and most of the colors have fallen down.